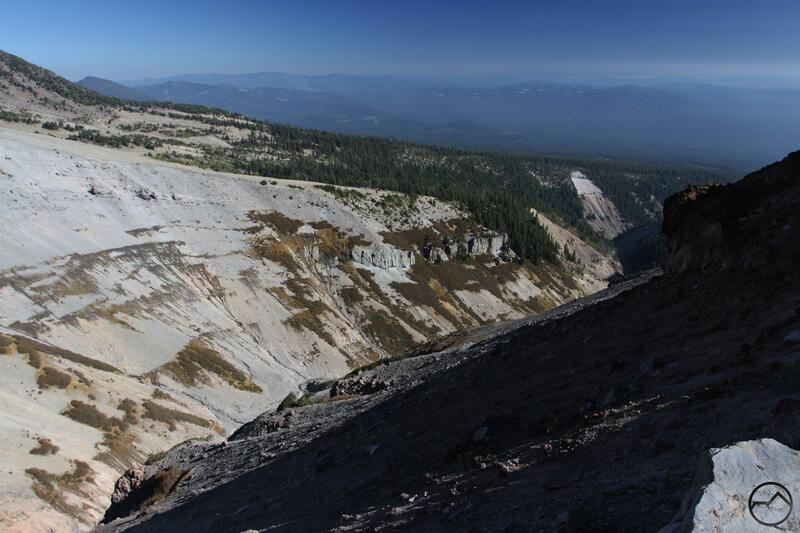 Jaw-dropping view of Mud Creek Canyon on Mount Shasta. As John Muir once noted, Mount Shasta is the polestar of Northern California. Geographically, the entire region orients around the incredibly massive volcano. It is one of the premier mountains in the U.S. Whether one is considering height, volume, wildness or sheer beauty, Mount Shasta is one of the great treasures of the American West. Though it ranks high in the esteem of mountain lovers, most of the mountain’s geography is shrouded in mystery for the majority of those who admire it. There are many incredible spots on the mountain, places of tremendous beauty and staggering scale, which go almost completely unappreciated. Perhaps there is no truer example of this than the case of Mud Creek Canyon. Easily one of the most dominant features on Mount Shasta, it ranks equally with Shastina and the mountain’s quartet of gigantic glaciers. While Shastina is easily recognized from far below and at least the Whitney and Bolam Glaciers are obvious from the Shasta Valley, Mud Creek Canyon remains unobserved from areas below the mountain. 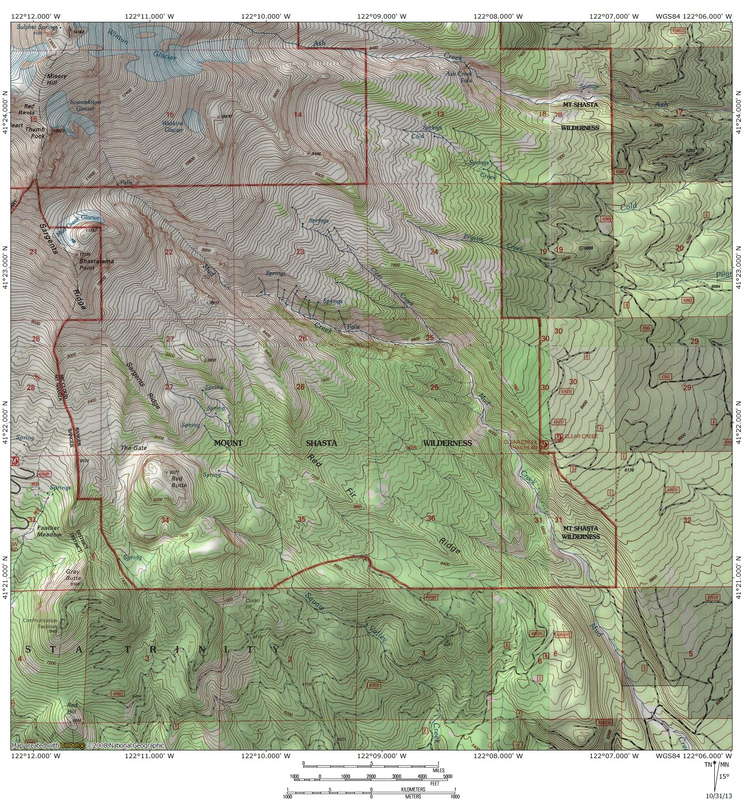 This is a consequence of the canyon’s position above the vast McCLoud Flats, a heavily wooded area with a paucity of good, elevated vantage points from which to observe the mountain. What the canyon lacks in ease of viewing, it makes up for in the enormity of its scale. Considering that it cuts into the flank of a single peak, its 6 mile length and depth of over 1,000 feet is truly imposing. That such a magnificent feature remains so seldom seen is testimony to how wild Mount Shasta really is. The primordial heart of Mount Shasta. Cutting deeply into Mount Shasta’s southeastern flank, Mud Creek Canyon is a place of wild, hellish beauty. It begins at the foot of the Konwakiton Glacier, one of three small glaciers that are scattered around the south side of the mountain. Of course, these glaciers are only small when compared to the behemoths that cloak the north and east sides of the mountain. 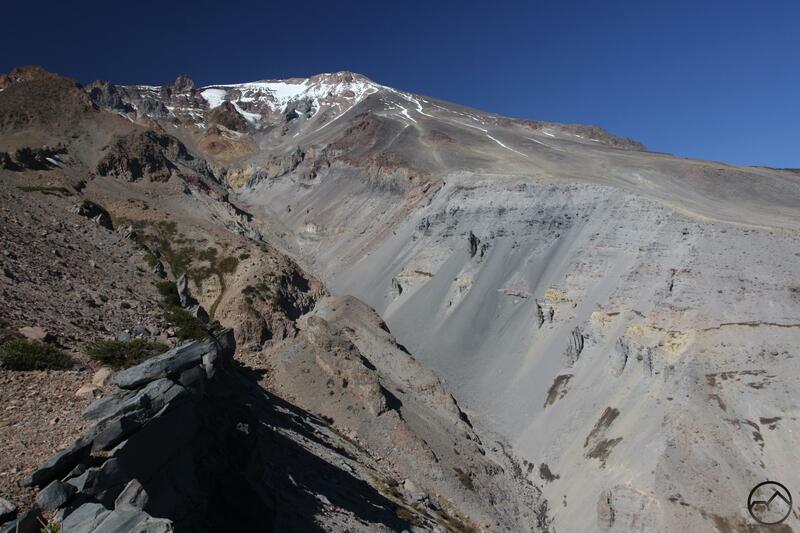 The Konwakiton Glacier still manages to cover over 1,500 vertical feet of Mount Shasta. 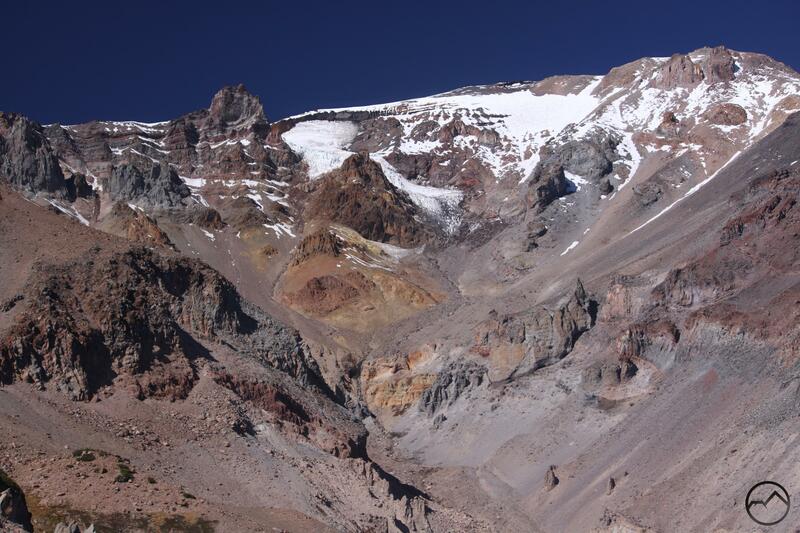 The glacier clings to the upper portion of a vast amphitheater just below the volcano’s summit. In addition to the icy features, this broad bowl is lined with craggy spires and rocky pinnacles, evidence of the fiery past that shaped Mount Shasta. 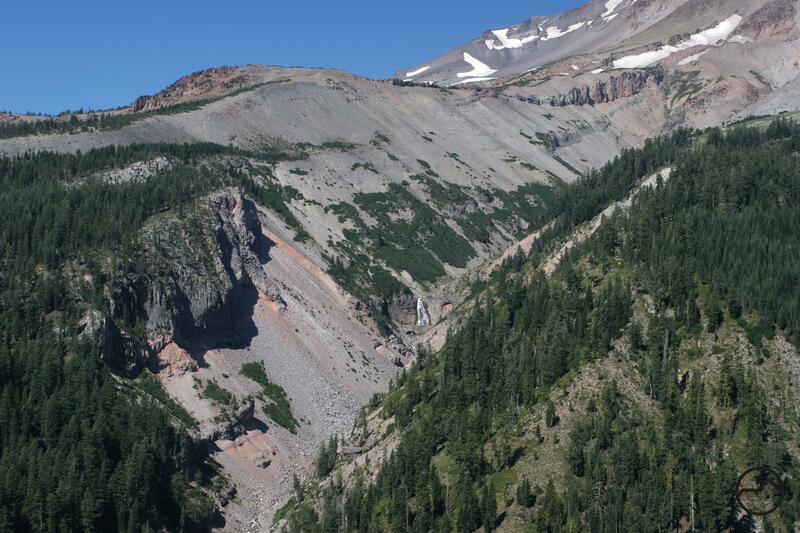 Indeed, this area and Mud Creek Canyon below it are considered to be the oldest exposed areas on Mount Shasta, remnants of a proto-Shasta from prior eruptive periods. At a basic empirical level this seems reasonable. No other area on the mountain exhibits such tortured geology. The amphitheater also gathers meltwater from the Mud Creek Glacier and the large Misery Snowfield. All of the runoff is funneled down into the canyon where it plunges over a tall waterfall that is unnamed but known unofficially as Konwakiton Falls. Though at times wispy, the falls certainly boast one of the grandest settings imaginable for a waterfall. “Thor’s Hammers” in Mud Creek Canyon. Below Konwakiton Falls the canyon deepens significantly as it gouges its path through the ash and rock that make up the mountain’s flank. This is a truly wild, seldom seen and seldom traveled place. In truth, it is a never-traveled place for the slopes of the canyon are seemingly boundless screefields. When standing on the rim of the canyon, listen for the sound of falling boulders clattering down into the unreachable depths. The sides of Mud Creek Canyon are still in search of their angle of repose. Those who are patient enough may even see small scree slides up near the top of the canyon. While most of the canyon’s walls are loose debris, they are punctuated by giant hoodoos emerging from the scree and towering over 100 feet above the rubble. Indicative of the mountain’s volcanic history, the hoodoos are particularly reminiscent of the Thor’s Hammer hoodoo in Bryce Canyon National Park. I have taken to referring to these twisted towers as Thor’s Hammers in honor of the famous landmark in Utah. Another fascinating feature at the bottom of Mud Creek Canyon is the permanent ice. The ice is nearly completely obscured by layers of talus that has slid over it. Though these patches of ice are not glaciers, they do exhibit some glacial features. Rock and fire are not the only forces that created Mud Creek Canyon. 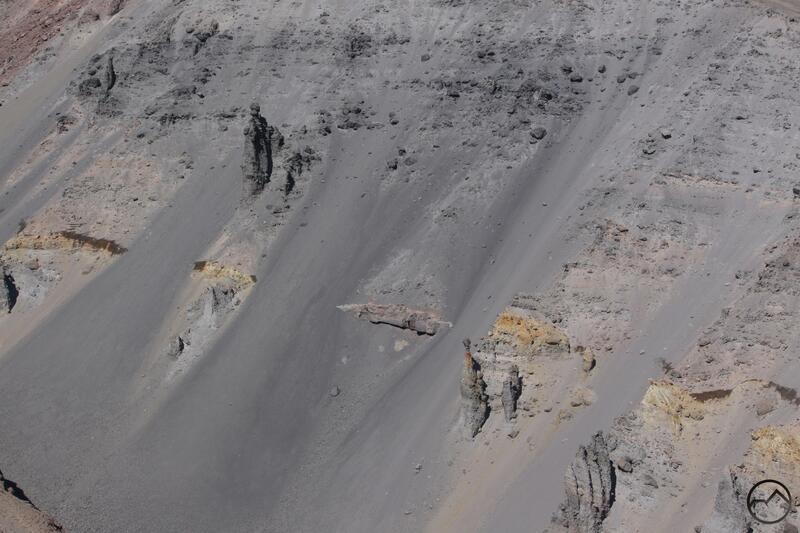 Water has played a tremendous role in the formation of this incredible gash on the side of Mount Shasta. Mud Creek roars through countless rapids at the bottom of the canyon. It is loudly audible from high overhead on the canyon rim. Amazingly, the sides of the canyon are littered with springs, especially the areas further down-canyon from the uppermost section where the hoodoos are located. The layers of material within the mountain are exposed on the sides of the canyon and the aquifers that exist between certain strata are cut open and flow down the sides. One unexpected result of this is the abundance of riparian plant life that clings to the thin margin of water on the otherwise barren slope. However, despite the beautiful and unusual abundance of springs on the side of the canyon, it is Mud Creek Falls that is the most memorable water feature here. The large, powerful waterfall thunders over a cliff that is well over 150 feet high. The cataract is the largest waterfall on Mount Shasta and is second only to Ash Creek Falls in terms of beauty. Mud Creek Canyon and Falls from the Clear Creek Trail. It is a wonder that, for all of its size, beauty and fascinating geology, Mud Creek Canyon has remained so seldom seen. Most who do observe it do so from high above while climbing up to the summit of Mount Shasta. It is also viewed by those who hike the Clear Creek Trail. This is actually one of the two trails on Mount Shasta that offer a good opportunity to experience Mud Creek Canyon. The Clear Creek Trail ascends the rim of the lower canyon, which is the area downstream from the confluence of Mud Creek and Clear Creek. The view from the trail is astounding. Mud Creek canyon extends up toward the summit, its deep V-shaped gap incising deep into the mountain. Mud Creek Falls is prominently visible from this perspective and is a particularly memorable highlight. A few intrepid adventurers descend into the canyon and repel down the falls. The other way to get to Mud Creek Canyon to is to hike to beautiful South Gate/Squaw Meadows. From there, one can make a fairly easy cross country scramble to the west rim of the canyon. If one completes the scramble correctly, there is a stunning perch perfectly positioned to get a panoramic view of the most of Mud Creek’s gargantuan gorge. One can trace the course from Konwakiton Glacier, down the eponymously named waterfall, through the hellish, hoodoo lined upper canyon, down the vast spring-lined main part of the canyon and onwards, downstream into the lower canyon. I have dubbed this vista “Grand View Point” in an obvious nod to the point of the same name at the Grand Canyon. Like an observation deck, the vista has a nice wall of rock fencing it off and preventing those fortunate to make it here from sliding into the canyon. While standing here taking in this awe-inspiring but seldom seen view one can hear the roar of Mud Creek mix with the sound of boulders clattering down to the bottom of the canyon, evidence that Mount Shasta is a living mountain still taking shape. Looking downstream toward the lower canyon. Scree-covered ice along Mud Creek. Staggering view of Mount Shasta and Mud Creek Canyon. Expansive clouds over Mount Shasta and Mud Creek Canyon. The photos and information in this post were so good that it deserves a comment, and since no one else has yet, I will. Great post! Thanks much! I really, really appreciate it. Still, I can peck at the keyboard all day but something as awesome as Mud Creek Canyon speaks pretty loudly for itself! Yes, excellent post Bubba! It’s a great example of why your blog is great reading for anyone interested in geography and landscapes, even if they don’t have immediate prospects for visiting Shasta. You’re definitely making me think I need a two-week trip up there someday! Thanks Jackson! I have always thought that good outdoor writing should inspire folks to go somewhere or allow them to experience a place vicariously, all while giving good beta. I don’t always succeed at that but that is the paradigm that I use. I had the opportunity to hike around Yosemite National Park as a teenager and got the opportunity to go and see places that most people are not lucky enough to see in their lifetimes. Unfortunately, my hiking days are all but a memory now. But this is one trip I wish I had the opportunity to do… Beautiful prose and beautiful pictures to match. Thank you for posting this. As far as getting down to the creek or anything like that, there are only cross country routes. No trails get anywhere close to the bottom of the canyon. Only a few very intrepid folks attempt it. Awesome geography lesson! and yet another reason to explore my mountain MORE! What time of year do you recommend to see the waterfalls and have water in the creeks? Guessing July? July or August are best if it is a normal year. If it is a late winter I would say July might be too early to really appreciate it. Ironically there would be too much snow. That said, there are so many springs feeding Mud Creek that there is good flow all year. The place sounds wonderful because this post is so beautifully written. Mud Creek Canyon inspired the literary in you! Thank you for the compliment. If I did get literary, it certainly was a visceral reaction to a place of great beauty and epic scale. I would credit the mountain more than myself! Great photos! Judging from the snow, I think I was at the west edge of Mud Creek just a week or two before you this Fall. I’m planning a day trip from the Ski Bowl to Clear Creek TH, probably next summer or fall. Have you done this?